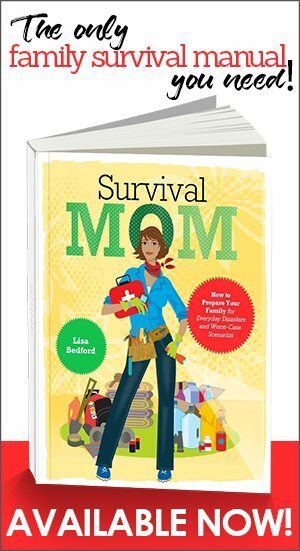 The winner of the Survival Mom of the Month (February) is Faith, aka MilkweedMama. Faith has an inspiring story to share as well as some fantastic advice! Faith wins a copy of Survival Mom, a $25 Amazon gift card, the DVD set of, “Grow Your Own Groceries,” and a PurifiCup Portable Water Purifier. Congratulations, Faith! 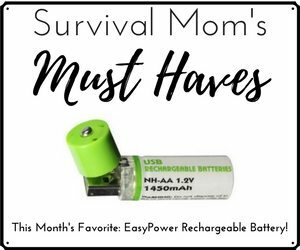 Be sure to nominate yourself or another Survival Mom for our next Survival Mom of the Month, and don’t worry if you have fewer resources, less stocked up, etc. We’re looking for women who are being proactive and will share what they’ve done. What possible emergencies are you preparing for? As a young child I moved to Florida from Portland, Oregon and encountered hurricanes for the first time. I also encountered evacuating for the first time. When we arrived at the vacant house that we were using as higher ground we had no electricity, no running water and no furniture. Even at my age I had thought to pack pillows, blankets, food, and a lawn chair for my 82 year old grandmother to lie on which turned out to be a good thing as the hard wood floors didn’t offer much in the way of comfort. Although I don’t remember much else, I do remember my parents being utterly amazed regarding what I had thought to pack in the back of our station wagon. And I remember being utterly amazed as a young child at what my parents had not thought to pack after spending a miserable night and day in our “shelter”! Fast forward to several stints as a volunteer Registered Nurse in the remote regions of Haiti and my prepper fate was solidified. 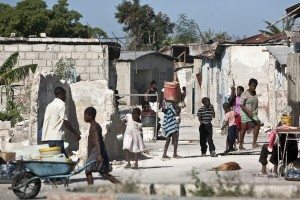 I left the Haiti experiences more determined than ever to be prepared. I also left more thankful than ever to live in a country where we have the resources to be able to prepare whether we think we do or not. When you live and work in a third world country you have a tendency to focus on the basics of survival rather than the cause that generates the necessity for survival preparation. I rarely focus on hurricanes, nuclear blast, or pandemic scenarios. I consider myself more of a generic prepper focusing on the basics. Enough food. Enough clean water. Shelter. Medical care. I have to say YouTube and the internet in general has been my favorite tools. Any question I have is answered right at my finger tips. I taught myself how to can by watching YouTube. I taught myself how to raise chickens reading various blogs on Google. I do a lot of researching and I spend a lot of time researching a vast number of subjects. If I find something I find particularly useful (like how to can butter that lasts for two years) I copy the article and put it in my homemade prepper notebook. The notebook contains everything from how to make a solar oven (I have one!) to how to make saline nose drops. I started this in case we have power outages for lengthy periods of time and my beloved internet is not available for quick references. Alas, Babylon by Pat Frank made a huge impact on me when it was required reading back in the old high school days. It is still one of my favorite books. I have a copy of The Physicians Desk Reference that I picked up at a thrift store. As a nurse it’s imperative that I am able to calculate correct medications doses in times of extreme emergencies if the medications are available. I am drawn to shows like the Discovery Channel’s Dual Survival and National Geographic’s Doomsday Preppers. I am always fascinated by peoples focus in certain areas and their skill sets. Jericho was an awesome albeit short lived tv series, as well, that cut to the quick regarding what is important and what is not important during a survival situation. Craig’s List and Freecycle are my all time favorites. I don’t have a lot of money to spend on preparation so these sights are invaluable resources for free and cheap items like rain barrels and firewood. Meetup.com is a great sight and you never know what groups are available in your area. I found a great Urban Homesteading group and a permaculture group in my city. What have you done to prepare your home and family for these possible emergencies? I am also the mom of three adopted special needs children so my medical focus is a little out of the “norm” when it comes to preparing for disaster. Because of my kids complex medical conditions we are way beyond simply storing up band aids and Tylenol in our family! My son has Osteogenesis Imperfecta (brittle bone disease) so I have adequate pain medication and splinting and casting materials on hand in case of fractures which are part of our every day life. They all have asthma so in addition to their multi-dose inhalers and rescue medications I have a battery powered nebulizer which also works off a car engine. The girls have cerebral palsy and one is unable to ambulate and uses a wheel chair. I am always cognizant of the fact that I will not be able to carry all of them if we are bugging out so having the chairs ready to rock and roll and/or having a wagon or, bike handy to aid in transportation is imperative. Jogger strollers are also handy on rough terrain and I have one that a friend of mine built from discarded parts of other strollers. I do the usual food storage and have it shelved according to expiration dates and am always looking for dates that give me the longest shelf life. I also taught myself to can last year by watching YouTube videos and take advantage of seasonal produce and utilize local farmers and markets. This year we added four backyard chickens and are getting 4 eggs a day now. I compost their coop shavings and manure and use it in our organic garden. We have bins of red wiggler worms to help dispose of scraps and they make wonderful compost for the garden as well. Nothing is wasted. In the garden this year I’ve branched out and added some fruit trees that don’t take up much room such as figs, Pomegranates, Surinam Cherry and bananas. My goal is to make my backyard into an urban homestead. Last year I added bug out back packs in the closet near our front door. One for each family member including one for the dog, cat and chickens. I copied birth certificates, social security cards, and pertinent medical records and placed them in each backpack in a plastic, water resistant bag. The originals are in a small fire proof, water proof safe which I can easily toss into the van if we have to leave quickly. Periodically, I go through them and make sure I don’t need to add or remove anything. Each child has an identification necklace and whistle to wear around their necks. 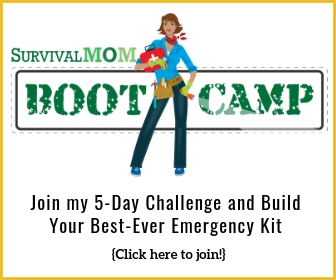 What advice to you have for new Survival Moms who want to prepare their families as well? Start now and quit procrastinating. None of your excuses regarding having plenty of time to get started or not enough money to prepare are legitimate. Even the poorest family can afford to buy one small bag of cheap rice a month and store it away. And don’t even get me started on people who tell me they can’t afford to prepare but go to Starbucks everyday or frequent fast food drive thrus. Do not think the government or local cities are going to be able to feed, cloth or rescue you during times of extreme disaster. We are so inclined in the USA to rely on bailouts that it is hard to get past that mentality and that is dangerous mindset. People in this country are not used to waiting in long lines or delaying gratification. Prepare to be as self sufficient as possible as soon as possible because our microwave society can blow at any moment. Start simply if you’re not a prepper by nature. Make your own laundry soap. Put up a clothes line. Purchase some canned goods. Stock up on medication. Start thinking outside of the box. When I was evacuating during Hurricane George I thought I’d stop by a local chicken place and pick up a couple of buckets for my gracious host who was putting us up in her non-evacuation zone home. I noticed the guy in front of me peeled out and gave the employee the finger. “Welcome to our restaurant. May I take your order?” When I ordered the chicken she replied, “I’m sorry. We are out of chicken.” Everything I rattled off they were already out of so I asked her what she did have? It only takes a couple of hours for a grocery store or fast food place to empty out. Even during times of “impending disaster” food disappears fast and tempers flare. Do yourself favor and avoid the trip, the lines and the irate people by being prepared. Build community relationships. Start in your own neighborhood. When you are preparing think beyond your family to that elderly neighbor down the street or that single mom. There is strength in numbers and everyone has something to contribute. There are preppers who do not feel the necessity to share anything and would turn you away in a heart beat. I am a firm believer in the fact that we will reap what we sow. Prepare ahead of time so you do not feel compelled to sow selfishness. Don’t think you need a tremendous amount of money to be a prepper. Utilize free stuff. Re-use. Re-purpose and re-cycle. FAITH: I really, really love your attitude. While I do recognize that we must take care of our own families first and foremost, I also believe that we have a moral obligation to watch out for each other. Building strong communities is how our ancestors were able to thrive in the toughest of situations. They did not hunker-down when times got tough—they helped each other through those times. You are an inspiration! God Bless! Thank you for this post! I so encourage every time I come over here, and being a new prepper, it helps me to not be so overwhelmed with it all. I *get* so encouraged…correction to above comment! Faith, liked your post. I have a son w/ Autism and the one thing i am afraid of is how do you “bug-out” with a teen that has extreme anxiety? I have been stocking up on can food but I am the only one of three that can eat it. My hubby has special dietary needs and my son has sensory issues related to foods. I do not want this to discourage me from preparing for a disaster. Any help would be appreciated. Some ideas to try: Practice “Bugging-Out” every week. Say that you are “bugging-out.” Loading up everything you plan to take and the go someplace for the day. This way the packing and the term becomes something routine instead of a stress point. It seems to work for kids and dogs period. As for the food, maybe you should precook what he likes and then dehydrate it. Then you only need to add hot water to get a good meal. i wanted to let you know something to look into is dinner is in a jar by kathy clark . i hope this will help you out for your son . wishing you and your family well on this . if i come across anything else on this situation i will try to locate you again and give you a message . Rachael don’t let anything discourage you from prepping! My oldest is Autism Spectrum disorder and does not follow directions well especially in times of stress. I love the idea of practicing bugging out and I think this would be a good thing to do with your son….maybe on a weekly basis. Kind of a desensitization process. I am interested in the dietary needs of your husband. So many people think they have dietary needs…gluten free is such a fad now but unless you have Celiac disease you can certainly survive very well by eating gluten and if we are in a bad way we will eat anything we can find! But for those who really do have special dietary challenges it’s going to take some brainstorming. 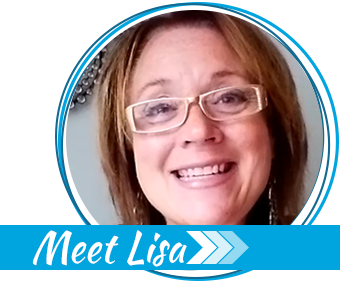 I would love to hear about the dietary challenges you face. Having a heart for special circumstances compels me to want to know more. I am very committed to prepping for others than my own family!